I wanted to give a little blurb today about a notion that I used in my Craftsy class (no longer available) - fusible web. There are many different brands of fusible web and in my zipper class you'll notice that I used the Steam-a-Seam variety. Having received a lot of questions about this product, both on the platform and more in my email, I thought it would be a good idea to talk about it some. Let me give you a little bit of a back story first. Last year I purchased a Thread's Insider pass (totally worth it by the way) and I found that there were all these videos on Industry Secrets by Louise Cutting. I've become a HUGE fan of Louise (she's a genius!) and would love to one day attend one of her workshops because I think she just has so many great secrets and she goes about making things easy and fast instead of always trying to convert you to the long way of doing something. In one of the video sessions she talked about fusible web and how its one of those tools that she never lives without. Then I used it and I was converted! Seriously, this stuff has sooooooo many uses and I can't even believe that for so long I discounted its existence. So let's talk about what it is and a few myths that surround this product, shall we? Oh yes, we shall. Fusible web is a temporary baster. This means that you can use it to temporarily baste anything in place. This can take the place of basting something by hand and I say "can" because there are times that you might want to baste by hand (but I pretty much don't anymore, ha!). I use this product to temporarily baste the centered, slot seam zipper in place in my Craftsy class. Can I just say that for years I never used this zipper application because I felt that it was the hardest zipper application to get looking good. I dare you to take this zipper application out of your bag of tricks and try to get those topstitching lines perfectly even on each side of the zipper without the use of the fusible web. Wait, let me up that ante - do it without having to rip it out at least once or 5 times. Yeah. It's really, stupidly hard. Really really. Then I was asked to do the Craftsy class and then they were like "we'll need to do that centered slot seam zipper, ya know" and I was like "of course." Inside I was quaking in my boots. Then I remembered the fusible web and the problem was solved! Temporarily baste that sucker in place and ha! The hardest zipper application is now the easiest and I've been using it all over the place lately. Plus you don't have to hand baste it in place and end up getting threads caught in your topstitching that won't come out or getting screwed up because your basting lines aren't straight but yet your topstitching lines are supposed to be. Yup, I'm not a fan of hand basting this sucker in, if you couldn't tell. Anyway, there have been a few questions that have arisen from my use of this product on the Craftsy platform. So let's chat about some of those too. Myth: Fusible web will gum up your needle. Fact: No, it won't. Take my word for it because I actually use it! Ha! And I use it all the time. 100% NO GUMMING! Myth: Fusible web can leave permanent web and gum on your fabric. Fact: It doesn't leave gum on your fabric and its not permanent really in any way. It's temporary. You can even peel it off your fabric if you need to move something somewhere else - like a zipper. I've even used it on silk. Plus, unless you're using this product the way that you're not supposed to, you won't be able to see where you've applied it anyway. Whenever and wherever you use fusible web, just know that its temporary and you need to permanently stitch it in place later on down the road. Plus, to add better to best, you can use the Wash Away Wonder Tape and yeah, it actually washes away after the first use. With that friends, I've since tried new brands of this fusible web: the Clover fusible web and Wonder Tape by Collins. The Clover brand works just like Steam-a-Seam, but I like it better because the tape that you pull away is just well easier to pull away. The Wonder Tape is just as awesome and doesn't need steam or heat to set and it washes away, like I just said upstairs there. 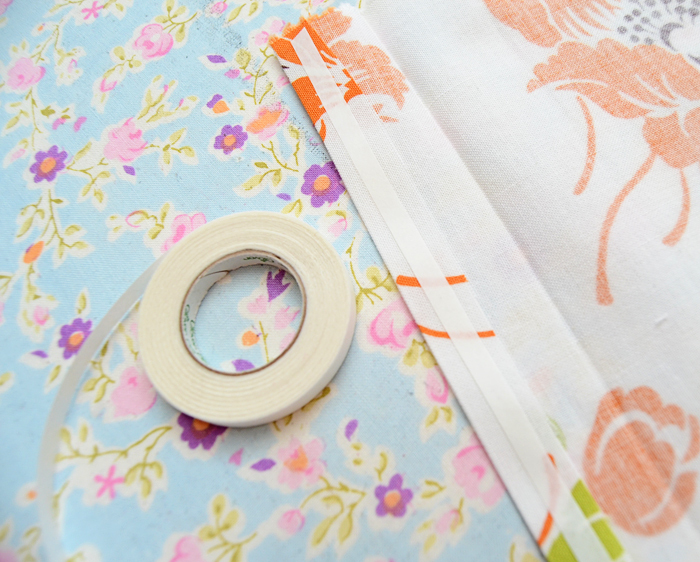 Slap it on your project, peel off the tape and temporarily baste whatever in place. Voila! Tomorrow I'll be back to show you some of my favorite applications of this product and hopefully you'll be converted too! Thoughts on fusible web anyone? Are you a convert yet? I too, sooooo appreciate Louise Cutting's expert tips and techniques. She is the best. i tried the fusible web on a zipper recently and it´s really practical. Before that I used to baste my zippers...I never trust just pinning. i would say the only down side is price! Other than that...it´s genius! Patty the Snug Bug used to gush to me about Steam a Seam, but I hadn't found cause to check it out, because I work with so much cotton I never got frustrated hem or zipperwise, but I'm helping a friend with a costume project in a super silky poly blend, and I bet wonder tape is just the thing to help with some of her pinning/basting frustration! I've always wondered about this product and never understood it. I've always assumed as well that it's sticky and would leave a residue. So, I appreciate this post and really look forward to learning about ways to use it. I am a recent convert! Now I LOVE this stuff!! Last month I used Steam-a-Seam on the wrap ties/neck band on my Pavlova top, about 3m long, and it stitched like a dream. NO pins! I couldn't imagine pinning that lengh and wrangling it through the machine. Then last week I was replacing zippers in some hoodies and stumbled upon some Wonder Tape in my OWN stash! I don't even remember using this stuff in the past, must have been decades ago! But it was the BEST thing to keep the new zips in place, with no gumming up on the needles. Worked like an absolute charm. 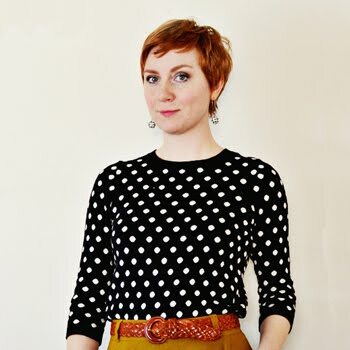 I love the Threads Insider membership, I've learned so much watching Louise Cutting's videos. Extremely reasonable price, and Well worth it. Oh I love this stuff, I always use it when hemming slippery fabrics and knits, it keeps everything nice and neat! Great post and an avid user of fusible web. I always stock up on the Warm Company Steam-A-Seam 2 brand. Its perfect for the reasons you mentioned, perfect for lining up plaids, great for using as a stay tape for necklines on wovens.... just love the stuff. I just purchased some last week to hold down neck facings that kept popping out, I thought I was genius but I didn't realise its only a temporary tool! Thanks for the tip. I have used this stuff for a few years now after reading about it somewhere online. It is great, I use it a lot. I used Stitch Witchery for years while I was in the military. Military BDU uniforms require patches...LOTS of patches. Name tape, service (USAF in my case), command patch, unit patch, speciality badge, rank on both sleeves, etc. They have to be perfectly placed and totally straight. Placing them with SW and then sewing in place was an absolutle life & time saver. I never thought to use it in zippers and you are right, top stitching is really really hard. I love your class and picked up Ateam a Aeam on my first stop by the fabric store after enrollment. Thank you SO much for the tip! My side seam invisible zipper installed perfectly on the first attempt!